When it comes to the weather in California, one word has dominated the headlines in recent years: drought. However, this year is off to a much rainier start than years past. While we could certainly use the rain, it is important to remember the fundamentals of rainy day driving. Rain and water can make travel more complex and more hazardous, but our San Francisco car accident law firm believes drivers must take responsibility and exercise appropriate caution in wet conditions. According to SFGate, El Nino delivered on its promise of a wet start to 2016. Forecasters say that the weather phenomenon typically brings in warm Pacific Ocean waters that can add moisture to the region’s air mass. In San Francisco, where a typical January sees 4.5 inches of rain, January 2016 brought a whopping 6.94 inches, the highest total since 2008 and more than the past five Januaries combined (a statistic “helped” by the fact that January 2015 saw no rain at all)! Other impressive totals include 12.06 inches in Eureka (186% of average) and 12.68 in Redding (213% of average). While most of California is still dealing with drought conditions, forecasters say this may ease if the season brings in 150% of the average rainfall. One section along the North Coast has already been removed from the official drought tally. Edmonds.com begins its discussion of wet weather driving with a surprising fact – Rainy day driving is actually more dangerous than snowy day driving. The automotive industry company cites National Highway Traffic Safety Administration data finding a higher likelihood of crashing during wet, rainy conditions than during wintry weather like snow or sleet. Why? Perhaps because fewer people hit the roads during snowy weather, but it is likely also because people take rainy day driving for granted and forget to prepare. Prepare your tires – Make sure you have sufficient tread. Experts now recommend using a quarter (versus a penny) and placing it upside down into the tread. If you can see the top of Washington’s head, you need new tires. You also want to check your tires’ air pressure regularly. Prepare your car – Proper maintenance on the rest of your vehicle is also key. 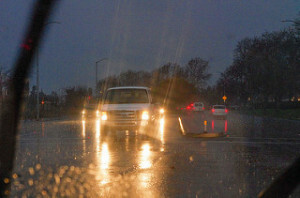 Important items to check include windshield wipers, headlights, taillights, and turn signals. Slow down – Speeding is dangerous anytime, but especially in wet weather when you lose traction. Wet weather can cause up to a one-third reduction in the amount of friction built up between the tire and the road. In rainy conditions, experts suggest reducing your speed by about a third (from 55mph to 40mph) although that is a rough guideline and sometimes slower travel speeds are best. Stay back – In dry conditions, travel about 3 to 4 seconds behind the car in front of you (use a fixed marker like a telephone pole for reference). In wet weather, increase the travel distance and stay 5 seconds behind the car in front of you, 6 seconds if it is raining at night. Likewise, when possible try to avoid being boxed in by cars on either side of you. It may not always be feasible in high traffic areas, but it is ideal to leave yourself a way out if a car stops unexpectedly. Be smart about technology – Do not use cruise control (including adaptive cruise control) and do not rely on forward collision warning systems. Wet weather can compromise certain systems’ accuracy and the act of releasing the gas before braking can provide extra traction that gets lost if cruise control is activated. On the other hand, traction control, anti-skid technology, and anti-lock brakes can help with wet weather driving. Hydroplaning – Hydroplaning occurs when tires ride atop a layer of water, losing contact with the road itself. If this happens, easing off the gas may be enough to regain contact. If that doesn’t work, gently press the brake to transfer the car’s weight and interrupt the hydroplane. Don’t steer until you regain traction. Skidding – Despite the old advice, experts now say to simply try to steer in the direction you want to go, a much simpler task than figuring out where the skid originated and turning into it. Wet weather can make driving more complicated, but usually it is a driver and not Mother Nature who is responsible for a wet weather accident. If you were hurt because another driver used poor judgment in wet weather, call our San Francisco, Oakland, or Santa Rosa car accident law office for help getting the compensation you deserve.